Take A Seat. Stay Awhile. 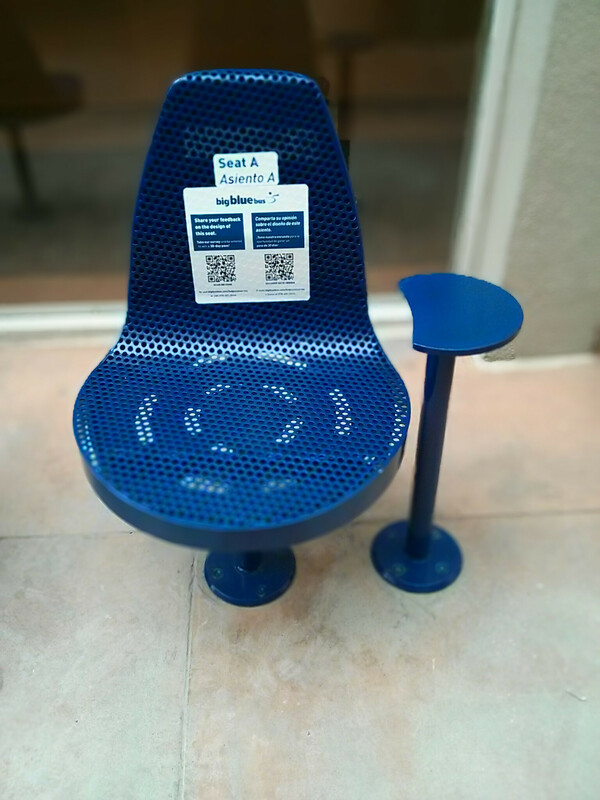 Throughout February, Big Blue Bus customers and community members will be able to view and sit on the two prototypes of BBB's proposed seat redesign at one of six locations around the City. Customers are asked to provide their feedback on the functionality of the seat through a survey posted online (www.bigbluebus.com/BSIPseatsurvey). 1/29 to 2/1 Ken Edward Center- street level drop off plaza. Customers are encouraged to complete the survey online in order to be eligible to win the 30-Day Pass, but may also find hard copies at the Ken Edwards Center or by downloading the PDF here. Customers may also complete the survey by phone by calling Big Blue Bus at 310-451-5444. In developing the plan for redesigning the seat, Big Blue Bus sought to include feedback from riders and stakeholders throughout the process and seeks to obtain buy-in on the final design. The original bus stop design was only available for viewing at the BBB yard for the public to view and try using. 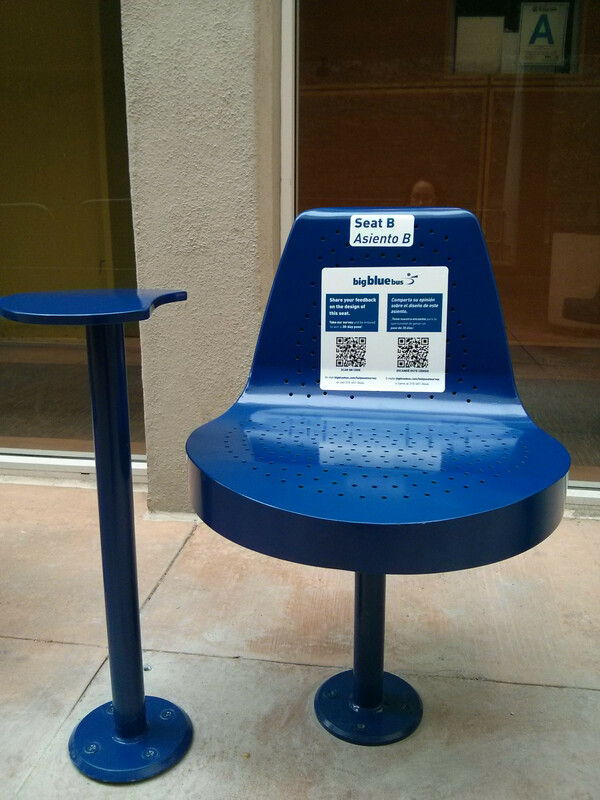 With the redesign, we will be installing it in six different places around the City so that as many people as possible can have a chance to try it out and provide feedback. The two seats being installed in the public right-of-way reflect extensive feedback on two prior prototypes during the fall from members of the City's Disabilities Commission and the Commission on Senior Community as well as a group of frequent bus riders of varying ages (millennials to seniors) and physical health. Now it is your turn. We invite everyone to sit in the redesigned prototype seat. Seat A and Seat B, as we are calling them, look similar but have modest differences in seat height, depth, and width which might affect your comfort and the seat's functionality. To solicit your feedback, we have developed a survey. To develop the survey, we did a review of the literature to identify best practices for collecting insights from the public on street furniture. Because of where we are in the project (construction has already commenced), we have structured the questions to gather your preferences as they relate to a project in progress. Ultimately, we want a seat that is universal so that we get the feedback we need in order to finalize the design of a chair that is accessible to as many people as possible. When the seat design is finalized, we will begin fabricating the pieces. The seat base and back will be installed on top of existing single seats. What will not be changing for most stops is how the seats are sited. At medium- and high-volume stops, the seats are sited so that riders can find shade somewhere during the day, although there is no guarantee that the shade will be cast over a seat. The requirement BBB worked with was to develop a schematic design to provide shade. Rain is such a rare occurrence so the requirement to provide shade took priority. You may download high resolution photos by right clicking the links below. Easter Seals Project In Action: Accessible Community Transportation In Our Nation. Retrieved from http://es.easterseals.com/site/EcommerceDownload/Universal_Design_FactSheet-5821.pdf?dnl=90752-5821-761N6ivu74JPUrFe on July 15, 2014. Easter Seals Project Action. Creating Accessible and Safe Bus Stops. Retrieved from http://www.projectaction.org/CoriTest/CreatingAccessibleAndSafeBusStops.aspx on July 15, 2014. 2010 ADA Standards for Accessible Design. URL: http://www.ada.gov/regs2010/2010ADAStandards/2010ADAstandards.htm. Ewing, R. (2001). Using a visual preference survey in transit design. Public Works Management Policy. Vol 5, pp. 270. Crouch, J., Lee, M., Carswell, C. M., Patrick, T., Seidelman, W., Sublette, M. (2013). Proceedings of the Human Factors and Ergonomics Society Annual Meeting. Vol 57, pp. 1490. Law, P. and Taylor, B. D. Shelter from the Storm: Optimizing distribution of bus shelters in Los Angeles. Transportation Research Board Record 1753, Paper No. 01-2992.